With 7% of journeys made by bike and around a third of the population using a cycle of some description once a month or more, Richmond has some of the best cycling stats in outer London. However, we get asked regularly about cycling on the pavement. The law is clear, you shouldn’t cycle on a pavement unless it is marked as shared use. That said, many shared routes are poorly sign-posted and the government has long recognised that there are many reasons people cycle on the pavement, ranging from things most people would find acceptable to the completely unacceptable. Richmond Cycling Campaign doesn’t endorse cycling on the pavement but we understand why a lot of people do it and that’s why we’ve been talking to the South Richmond Neighbourhood Team Safer Pavements team (led by Alan Laird and with the support of Pam Fleming, and others) about gathering more information and looking at possible solutions. Our view is that people cycle on the pavement because it feels safer than being on the road. 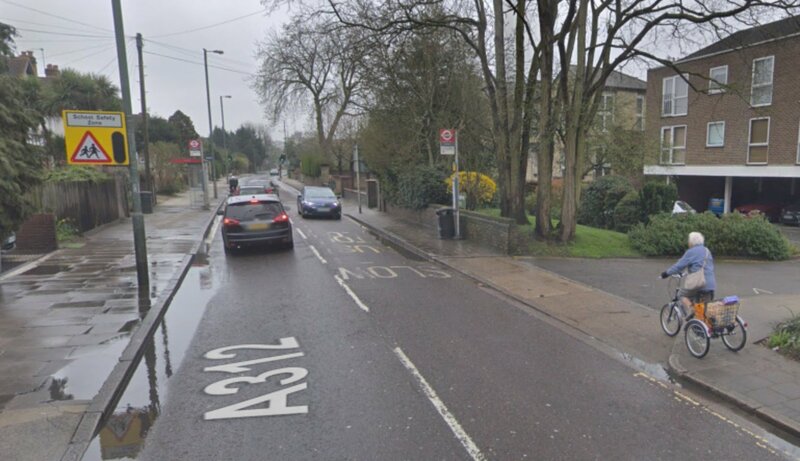 Whether you’re cycling on your own or cycling with your family, the absence of proper cycling infrastructure in the borough causes many routes to be intimidating and unpleasant. We urge anyone who has chosen to cycle on the pavement or in shared use areas to show courtesy and consideration to pedestrians. If you’ve experienced cycling on the pavement or if you do cycle on the pavement please contact us (info@richmondlcc.co.uk), or the South Richmond Neighbourhood Watch Safer Pavements team (richmondsaferpavements2018@gmail.com), with some more information, and we’ll try to collate what we hear. I don’t see why one side of a street cannot be allocated to cyclists on the pavement and the other side allocated to pedestrians. A classic example is Lonsdale Road where you rarely see pedestrians, particularly walking on the river side pavement. The cycle lane is barely 18 inches wide and with parking both sides of the street it is dangerous for cyclists. I feel the same should apply to Hammersmith Bridge. Cyclists take their life in their hands crossing by road, not to mention they hold up all the traffic and buses and it is extremely dangerous. Why not make one side for cyclists? I lived in Amsterdam for many years where all motorists are cyclists as well. The cycling paths are wide and make you feel safe on a bike. I now restrict my cycling to the towpath where I feel safe. The pathetic width of the cycle lanes in the borough are dangerous and need to be at least a meter and a half wide. Ber01 very well said indeed and excellent suggestion, if there was adequate infrastructure as you describe it, the issue would be solved- The so called “cycle lanes” are a complete joke, they are so narrow (example: Richmond,Church road, bridge over the train station:you get tightly squeezed between cars and pedestrians) – And i am not even talking about cars /delivery vans that drive or stop on cycle lanes. As I commute daily on my bike, and want to stay alive, I follow a pragmatic approach based on respect and common sense: using mostly the roads but also occasionally short sections of pavements to avoid road death traps -in that case, I dismount if there are pedestrians present. So long as cyclists either stop (if it’s narrow) or go slowly past pedestrians I cannot see any issue. Given people ride on the pavement for their own safety they should be educated as to how to cycle safely on a shared space with pedestrians. I have cycled on the pavement behind my 8 year old son who was also cycling to school. There are not enough safe routes for children to cycle in Richmond as the roads are too busy and many drivers too inconsiderate of cyclists. There’s too much priority given to cars in Richmond and not enough to other forms of transport including cycling and walking. I used to have one and people got fed up driving over Hammersmith Bridge waiting behind me but did never did I on the pavement but bicycles certainly do now and runners name it it’s lethal for pedestrians and I’m not that old yet! It comes down to Safety First. We all know that we shouldn’t cycle on the pavements and we would happily follow that rule if it made sense. I encourage my children to cycle on the pavements anywhere that there is a lot of traffic. However I also make them aware that pedestrians have right of way. I like the suggestion above about making different sides of the street available for different uses. I have been seriously crashed into TWICE by cyclists riding illegally on Richmond’s footways and sworn at and threatened 16 times by other illegal cyclists on footways – all while I was simply walking along lawfully. Cycling on footways is not only an offence – it is offensive. If cyclists want better road safety they should make our councils improve the roads , NOT threaten lawful pedestrians. My attempts to get Richmond Council’s so-called ‘Cycling Champion’ to run a public safety campaign for her own benefit, even at my own expense, have been blatantly refused and the police have said four times that they do not have enough officers to enforce the law. That is their failure. This problem was raised by a number of elderly people at last year’s public police meeting run by MP Zac Goldsmith but was ignored. Supermarkets attract cyclists on footways but my local Sainsbury’s has blatantly refused even to put up flags or signs asking customers not to cycle on the footway approaches to their store even though I offered to pay for them myself. I have nothing against lawful cycling, or against young children cycling on footways, but anti-social cycling by adults who cause danger to pedestrians is doing no good at all for the cause of the decent cyclist. Cycling on the footway in England and Wales is an offence under Section 72 of the Highways Act 1835 as amended by Section 85(1) of the Local Government Act 1888. Responsibility for enforcing this lies with the Metropolitan Police, who may issue a warning, a fixed penalty notice or choose to prosecute. If you have any issues relating to cycling on the footway in your location, then you should contact your local Safer Neighbourhood Team. Threatening or abusing pedestrians is a Public Order Offence. There have been a number pedestrians killed by being hit by cyclist. I hope those who advocate this illegal action are not the next to be hit and killed. If there’s no room and I get pushed into the kerb of course I have no choice but to cycle on the pavement …..I can’t go back home when I am half way to a place and motorists often can’t see cyclists due to no space to be set apart. In Barcelona the lanes are separate and sectioned off by a slug. I have to cycle to get around, it isn’t a luxury it is a necessity. I ve been cycling in every part of London over 33 years. I find it impossible to navigate dog walked, dogs not on leans and kids on pave,ents and towpaths. There is an aggressive attitude to cyclists when there should be space for everyone. No one has more entitlement than others we all need to get around. I can’t afford transport nor a car. So the bike is a practical clean so.ution to climate change for me. One of the reasons for a blanket 20mph speed limit across the Borough is to make the roads less intimidating for cyclists and safer too. Richmond’s provisions for cycling remain a work in progress. The Borough has not had the same success with mini-Holland and Healthy Streets/neighbourhood bids for grants as other boroughs and the significant infrastructure changes that cycling needs are slow in coming. That, however does not mean the increased use of pavements by cyclists should be encouraged. The pavements must be for pedestrians and not just as a right of way. Mothers with children (one or two in a pram or pushchair with one walking), the disabled, the frail and even the robust elderly find it quite frightening to encounter cyclists on the pavement. Young children can be accommodated particularly when supervised by an adult, but that’s as far as it should go.